any thoughts? its fixed now, but i wonder sometimes, i really do. My astra van passed its mot two weeks ago with a broken spring. Completely snapped through but it was hard to spot. Not really their fault mot is so cheap nowadays and they don’t get long to inspect all aspects of a car. the RAC and AA have some great inspections available, they put their name behind it, if you are buying a car then this is what you need. they are on my list next time i am buying. well ... lots of items on the car rust .. ive seen rusty coil springs .. its pretty common but i dont flag them up as needing replacement . Ive put cars on the ramp and as ive taken them up in the air there has been a bang and the coil spring has broken . ive seen cars with broken coil springs that unless i had run my finger in the correct place and felt it was too short at the base then no one would have been any the wiser . This is all Porsches btw .. i know what to look for .. an mot station works on all cars . Also .. an mot is a min safety lvl for it to pass. Imho .. it only tells you that at time of test the basic items that wont kill you are ok .
A tyre can be 1.6 mm .. it will pass an mot but it will be illegal a few days later .. although to be fair you should get an advise on that . I think the testers get about 45 mins to do an mot although im guessing 30 mins is more the norm and they do a brake roller check and emmissions as well as looking over the car for that . now imagine its a discount mot at £29.95 .. hmmm have to do a lot of them to make it worth while . Yup i know im rattleing on .. and yes im biased i agree .. but trust me .. if i thought a garage had done something wrong i would also be banging on about it . For this one instance though then i can see why they didnt spot it or advise the spring was rusty .. if it was broken at time of test though ... thats a FAR different matter . now imagine its a discount mot at £29.95 .. hmmm have to do a lot of then to make it worth while . Yup i know im rattleing on .. and yes im biased .. i agree but trust me .. if i thought a garage had done something wrong i would also be banging on about it . it could have been missed, if it was, well that's the nature of an mot, bloody useless really. A service will tell you that .. an MOT will certainly NOT tell you that . I only wish more people reallised that .. hell even my Wife said its passed the mot so thats all ok for another year .. sigh . Totally agree! The new smoke tests will see a lot of diesel cars failing since "visible smoke of any colour will fail". Hmmm, I can see failure rates increasing on cold winter mornings!! the RAC and AA have some great inspections available, they put their name behind it, if you are buying a car then this is what you need. they are on my list next time i am buying. I've sold many cars and have witnessed both AA and RAC inspections and they have varied in thoroughness hugely. I believe there is small print which effectively absolves them of any responsibility anyway so you will have little to no recourse in the event of a future failure. Much like the MOT, it's just an assessment of the car on the day of inspection. 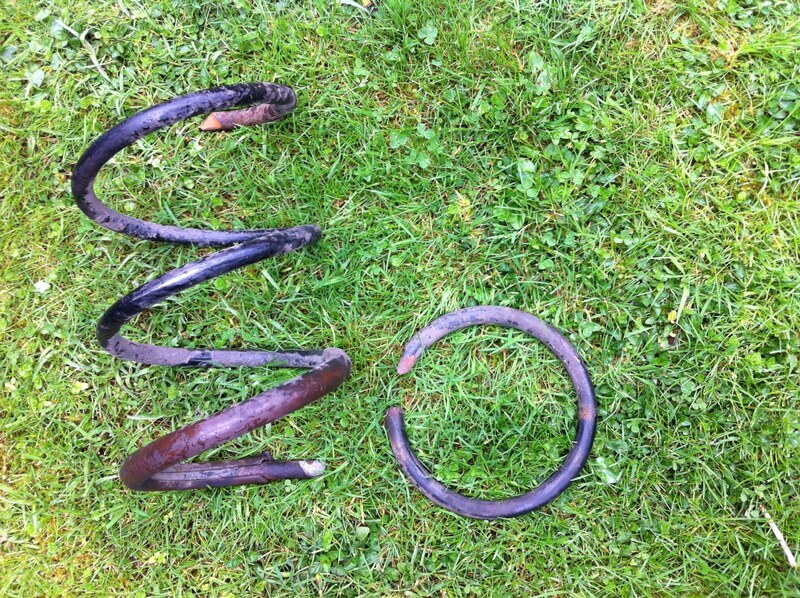 With regards your cracked spring, apart from the fact it's now in two pieces, it looks perfectly serviceable to me. I think the other garage is simply trying to do down their competition as there's no way of telling when a spring will break on a car and the location of the break looks to be where it would've been hidden in the mount anyway (which is also the most common failure mode). It doesn't necessarily take a pothole to break a spring, (potholes are more responsible for worn bushes, drop links etc - springs are designed and manufactured to absorb impact, whereas ball joints etc are more to keep things in position whilst allowing movement) the simple undulations of the road with a corner of a 1500kg car on it will be enough to finish off a spring that's on its way out. (I used to deal with Lemforder and have had plenty of boring, sorry I mean informative conversations about springs and other suspension components). As an aside advisories are entirely at the MOT tester's discretion and I'm not convinced that spring even looks bad enough to warrant an advisory. Always makes me laugh when an over-zealous tester advises things like "engine covers fitted obscuring some components" or "undertrays fitted obscuring..." Yes, the manufacturer made the car like that!!! my mechanic told me, an mot is really nothing, just a ticket to ride.